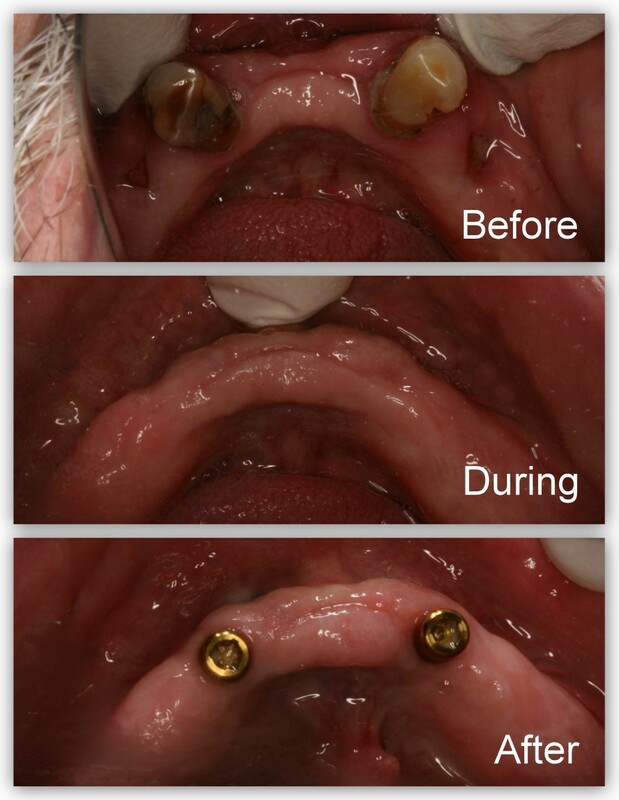 Before– This patient wanted to replace his missing lower teeth, but could not afford all implants. 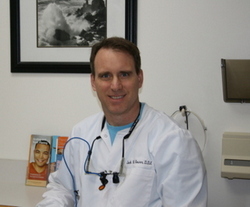 During– His own tooth roots were used as anchors to more strongly hold on to a removable partial denture. Here you see that into the roots of two of his teeth were bonded metal attachments. These will help secure the denture. This also eliminates the need to have unsightly metal clasps around the teeth. A– This is the attachment. B– This is the top view of the partial denture. C– This is the internal view of the denture, i.e. the part that rests on the gums. D– This is the internal aspect of the denture after it has been modified with retentive units (the black parts). These black parts will snap over the metal attachments that are in the tooth roots in the patient’s mouth. After– This shows the lower partial denture in place over the attachments. Before– This patient of Dr. Jack Hosner’s has multiple missing and broken teeth. He wanted his smile restored. After– Dr. Jack Hosner of Portage, MI used this patient’s two front teeth as attachments to retain a new partial denture. Before– This is a close-up of the same patient. 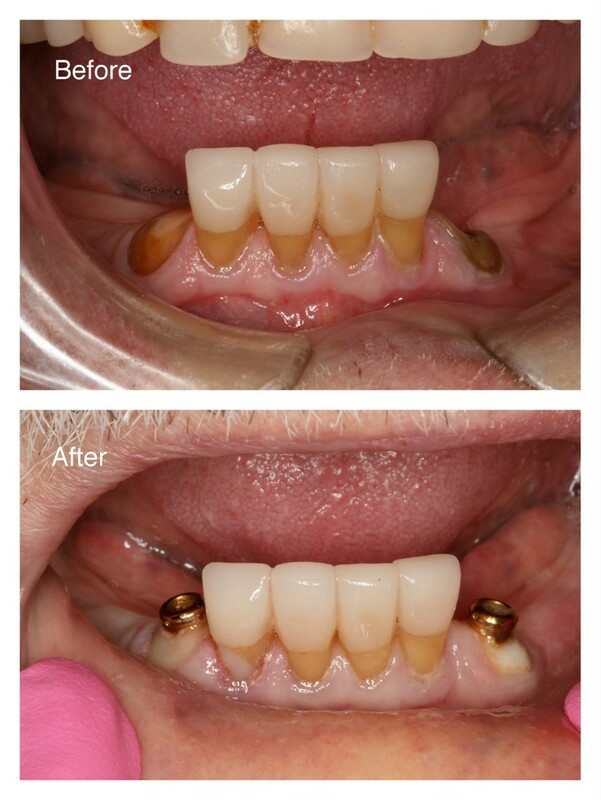 After– His two front teeth were cleaned up and gold attachments were bonded into the roots in order to retain (hold in place) a new partial denture. A.– This photo shows the underside of the partial denture with the retentive elements secured. These retentive units snap over the gold attachments to help hold the removable partial denture in place. Notice the metal clasps in the back which were needed to grab onto the patient’s existing teeth. B.– With the partial denture in place, notice how the attachments eliminate the need for an unsightly metal clasp on a tooth in front. Before– This patient of Dr. Jack Hosner’s has multiple missing, decayed, and broken teeth. He desired a partial denture but did not want to show a metal clasp on the front tooth. After– Dr. Jack Hosner of Portage, MI made a new upper partial denture that used one of the broken teeth as an anchor for an attachment that the denture snapped onto. This provides the retention to hold the partial denture in place so that a clasp in the front isn’t needed. It also provides better retention than a clasp. A.– Here is a close-up of his two broken and decayed teeth. B.– Dr. Jack Hosner of Portage,MI cleaned the decay out from both of these roots, restored them both with bonded fillings, and bonded a gold attachment into one of the roots. C.-This picture shows the underside of the partial denture with the blue part that snaps over the gold attachment. Two metal clasps are also seen that will grab onto two existing back teeth. This blue retentive unit eliminates the need to grab onto his front tooth with a metal clasp. Before– This is a top view of this patient’s only remaining lower two front teeth, which need to be removed. 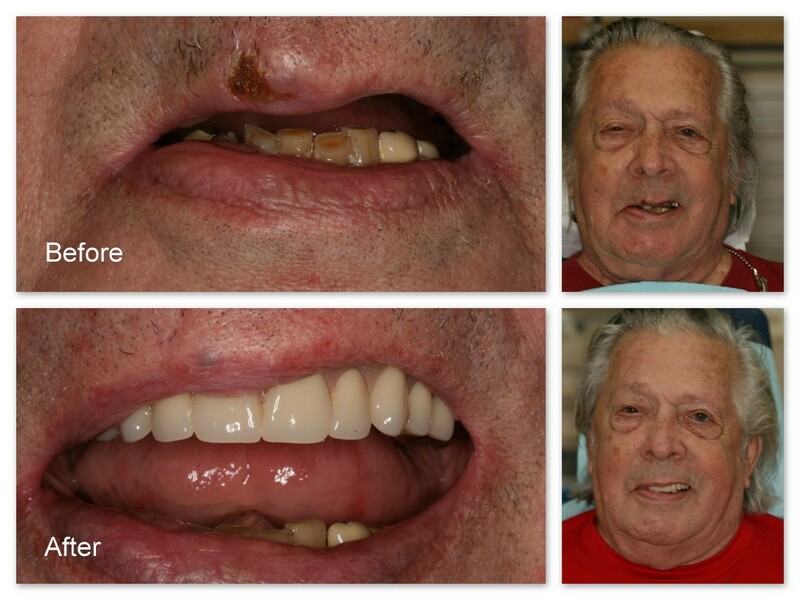 During– Here is the same patient after the teeth have been removed and bone grafting performed by Dr. Jack Hosner, and there is complete healing. 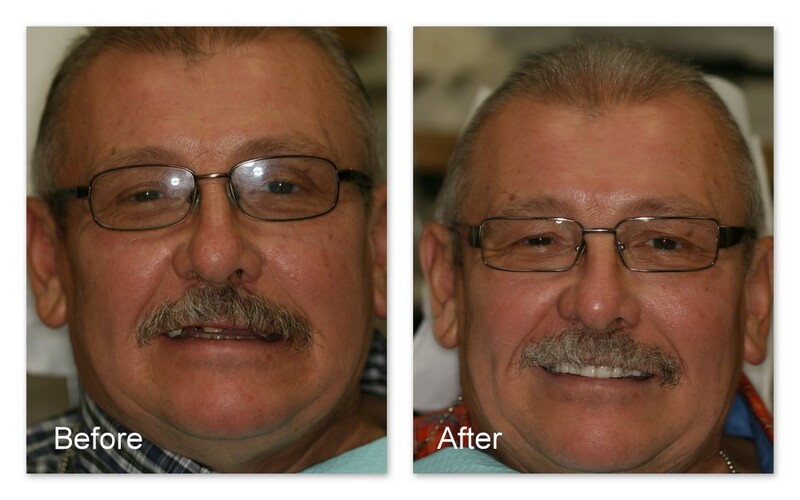 After– Dr. Jack Hosner of Portage, MI placed two implants into the areas where this patient’s teeth used to be. He also screwed onto those implants two gold retentive units (abutments). A.– Dr. Jack Hosner then made a denture with retentive o-rings bonded to the underside surface. 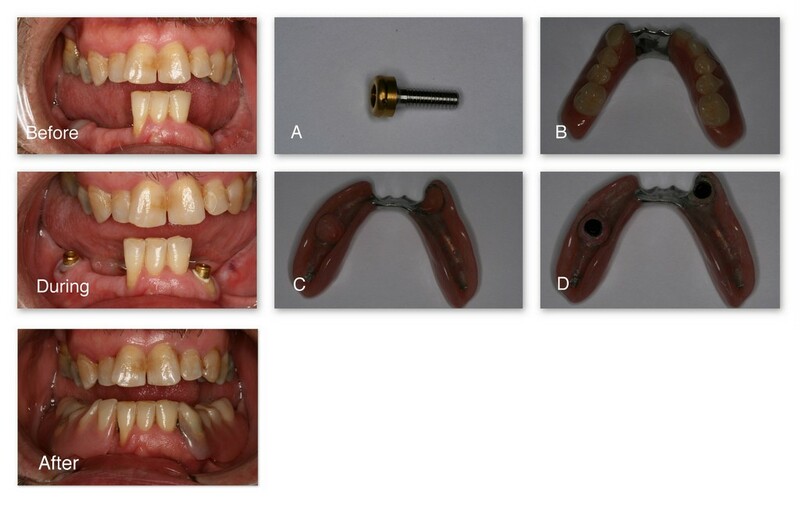 This ”overdenture” now can snap over the gold attachments, thus holding the lower denture in place. B.– This final picture shows the patient with his lower denture in place, and staying in place. Before– Dr. Jack Hosner of Portage, MI bonded attachments into the roots of two teeth to help retain a partial denture. After– This shows the partial denture in place retained by these attachments. Without these attachments, the partial moved around too much and was difficult or impossible for the patient to function with.